I feel like I’ve been waiting FOREVER for this to turn up… I ordered about a month ago, so I’m making the assumption that post from the Far East is slow-going at the minute. Missha M Perfect Cover was the name that kept cropping up following my last post showing my small collection of BB Creams and so it was this one that I decided to add to my ever-growing stash. Packaged in a squeezy tube with a pump dispenser, the 50g of product contained within is well-housed both for hygienic application and freshness. I don’t know why more base products don’t use this method. I opted for the shade #21 (light beige) and am pleased I did as it matches my skin-tone well, I’m around a NW15 for reference. The tone is fairly neutral to my eye, neither too yellow or pink but it does tone the redness down very well, which is something I find BB Creams excel at doing. 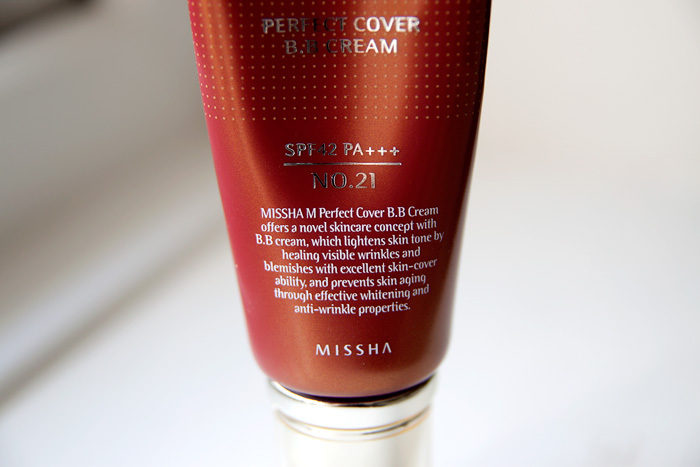 The particular skin benefits of the Missha M Perfect Cover BB Cream include: SPF 42 PA+++ (the PA+++ meaning that it is a broad spectrum product with the maximum UVA protection), skin lightening (hyper pigmentation) and anti-ageing. The texture is thick but spreads well, it doesn’t feel particularly heavy or greasy… something which many BB Creams are prone to doing. I find this quite moisturising but still wouldn’t be without an additional light moisturiser as base. I would describe coverage as medium, it evens out my skintone nicely without looking too heavy. It will dampen blemishes but not disguise them completely. A great choice for everyday wear but you may want something that offers fuller coverage in the evening. Compared to my other BB Creams, I find the Missha M Perfect Cover fairly matte. It’s not flat matte but I wouldn’t describe it as dewy either…. on my combination skin, it didn’t need powdering and neither did it allow too much oil to break down the effectiveness on my t-zone for many, many hours. It’s another LOVE to add to my collection… so easy just to apply with your fingers (as I have above) and there’s undoubted comfort in the knowledge that I have decent sun protection, good coverage and a little bit of added skin TLC thrown in for good measure. Thanks for recomending this one to me chaps, I’ve struck gold! 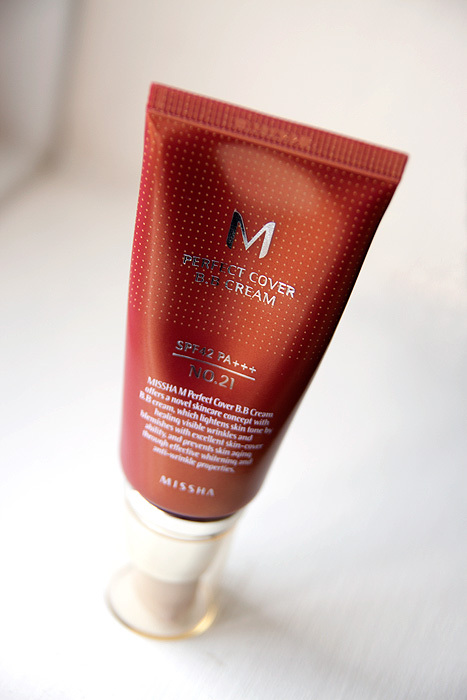 I bought my Missha M Perfect Cover BB Cream from seller FriedGreen on eBay and paid £11.78 inc. postage. Looks gorgeous! A very fresh looking finish. I’m starting to really prick up my ears with all this BB Cream talk that I keep hearing! Very nice glow! This is a very popular BB Cream in the Asian BBlogger community. I LOVE my missha am the same shade as you and have worn it constantly since I got it and ordered another two! Ooh, I just bought this but in the liughter shade 13, milky beige. I’m worried it might be too pale now but hopefully not. For the love of all that is holy, please swatch that when you can! I can’t find photos of it anywhere. This is my absolute favourite for everyday wear, it never clings or cakes and it lasts very well. 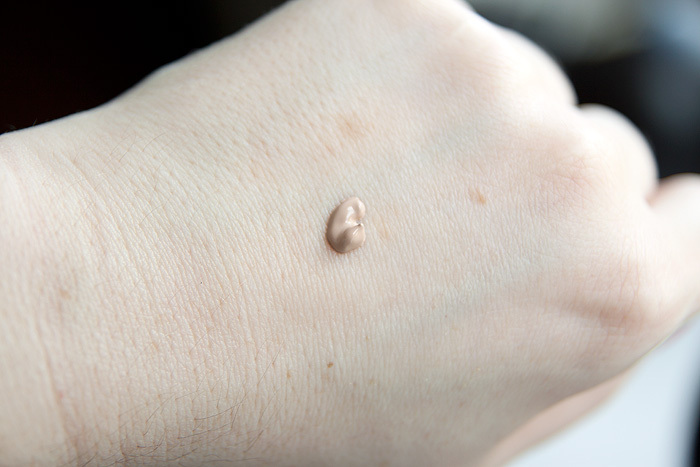 If I need more coverage I just add a drop of my Illamasqua Rich Liquid Foundation. I forgot to say (was too busy purring at your comment obv.) – please do jump in on this BB cream bandwagon. But go the Asian route, I really haven’t been v. impressed with Western brands interpretations of BB Cream thus far! I bought Etude House and Missha brands of BB cream, and I prefer Missha #21 as a better match for my NW15 skin tone, but I need to use oil-blotting papers starting about an hour after. Still, for a seamless, natural finish that conceals red, this stuff can’t be beat, and a little goes a very long way. The only thing I don’t love is the pump. I have to be careful not to dispense a full one or I could cover three faces. The color you chose looks great on you. It completely evens out your skin tone and blends flawlessly into your neck and chest. I agree this color is neither too yellow or pink, and I also don’t see the grey that many people complain about, but my skin is pink, so I wonder if those making the observations have yellow undertones. I have fair skin and I love bb cream because they are mostly made with fairer skintones in mind. There are lightening ingredients in many bb creams, but I believe that it’s more to *keep* skintone even and fair, instead of lightening a darker skintone… if that makes sense. I don’t think they’re really strong enough to do much skin lightening on their own. I really hope you love it. I think you might! Hey Charlotte, love your blog! Thanks for this great review, it’s got me intrigued. The product looks fab, but I’m not too sure what the skin lightening/whitening part is about.. what does that actually mean? My skin is pretty even and light as it is, so I’m not sure if that’s something I want to go for (apart from that, the product looks perfect!) Would love to know what you think. I really wish BB creams came in more colours! I agree with Ruth @ Flaomia, in it being meant for whitening but only comes in lighter colours. Yayyy. This stuff is the best and I’m happy to see it getting so much love on blogs lately. It’s just so gentle on the skin and looks so natural while still giving really nice coverage and it’s not too expensive. This looks really good. I have really pale skin smothered in red areas, tons of freckles and am prone to ‘rashy’ looking skin, so this could be right up my alley. #13 swatches here if it helps! Thank you so much! That shade definitely looks like it would suit me. Now, to save money. ur awesome, well done that lady! I got the lightest shade of this BB cream a couple of weeks ago and I am loving it. I want to try more BB creams now! I am worried that other brands will be too dark as #13 is perfecto for me. Yes I am that pale. Anyway, glad you’re loving it too. I wish there were darker shades of BB creams, I’m an NC42 and they simply don’t make them in my shade. It’s tragic! They do! check out this post! hello umm i just bought missha bb cream no:23 but i cant see exp date anywhere. there is a date on back side(on top). is it exp date or Date of production? There’s an M infront of the date – I’m going with manufacture, ‘cos mine is dated from before I purchased it! Are you a true NW15? (as in nw15 is the colour of your neck? )As you mention on your Illamasqua skin base review that your ruddy with your pale skin and dislike to pale foundations. So I wondered if you were really a hair lighter but prefered a bit of colour? I only ask as MAC said I was an NC15, and like you I like a hair darker and Id like to try this Missha M BB cream as you mentioned the colour 21 is really good on you so I was hoping It might match my nc15 neck? your skin tone looks very close in colour to mine on your photos and its really nice to see a paler beauty blogger, I find its harder to get a good foundation for paler skin as imperfections show up much more, would you agree?. 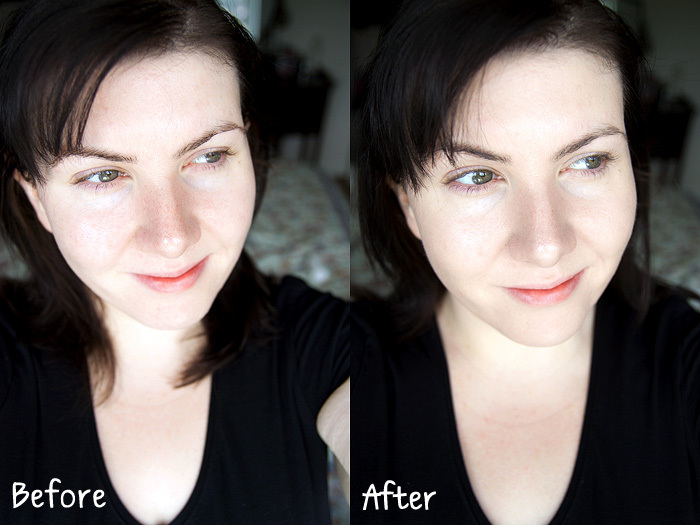 When im (fake)tanned its so much easier for my darker foundation to give me a flawless look. Hi Dana, I’m not really shade aware tbh. I’ve had NW15 in different MAC formulas and found that they’re completely different shades! But… as a general rule of thumb, anything darker than NW20 in the Summer is not gonna work for me by any stretch of the imagination. 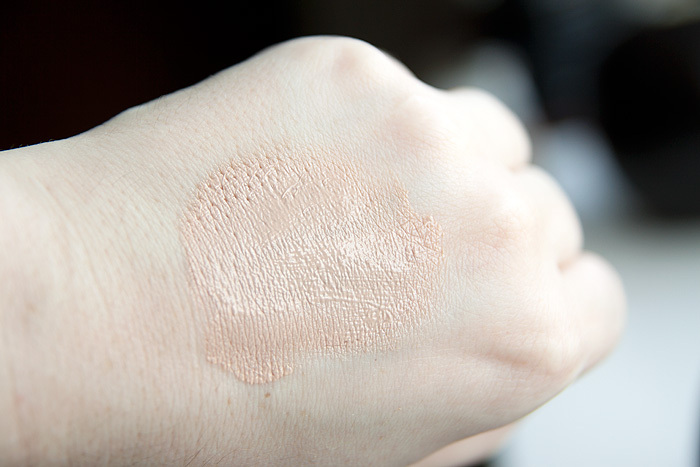 I’d say that you might find the Missha a teeny bit cool (pink) toned for you, it depends if you think you can usually get away with cooler foundations or if you need to stick to more yellow-toned shades? Hope that helps!